We try to get bone broth in some form every day, either via a cup of broth or a scoop of the broth gelatin straight from a jar in the fridge. 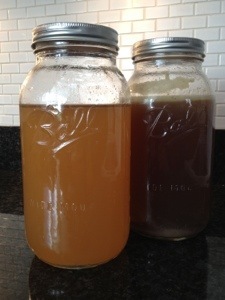 Bone broth is a very nutritious food that has numerous health benefits. It is made by slow cooking the bones, skin, cartilage, tendons, and even feet from an animal in water for 24 hours or longer. Typically made from the bones of chicken or beef, it can also be made from lamb or fish. An acidic medium (vinegar or lemon juice) is added to the cooking liquid to pull the minerals out of the bones while they cook, depositing the minerals into the broth. After the broth is cooled in the refrigerator over night it congeals into a gelatin. The longer the bones cook in the broth, the more gelatinous it becomes. 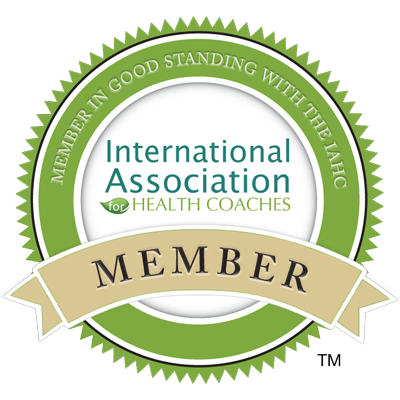 The end result is a rich healthy source of nutrients that is a key component to a healthy diet. 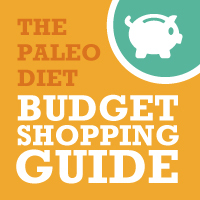 We buy a large container of grass-fed beef soup bones from our local co-op for super cheap and end up with a ton of health-giving bone broth. 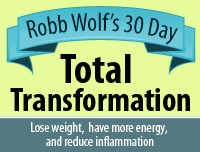 Such an inexpensive way to get a nutritional boost every day! 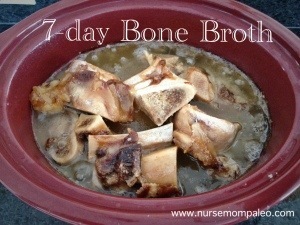 Most recently I made a batch of broth over the course of 7 days, using the carcass of one chicken. Here is the recipe. Go make a batch right now! “Good broth will resurrect the dead” South American proverb. 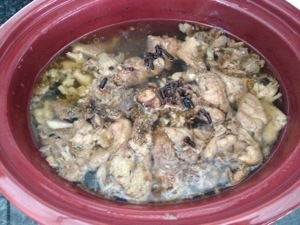 Place the chicken in a crock-pot and cover with water, 2 Tbsp ACV, and salt. Start on high until it is boiling then turn down to low and keep the crock-pot on low until the chicken is done, about 5 hours. 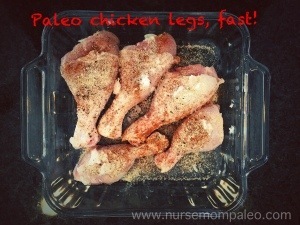 Take chicken out and clean off the meat. Then, place the carcass back into the crock-pot, throw back in all the skin and knuckles. Everything will cook down to bone broth deliciousness. Cover with water and add 1/2 onion, 3 smashed cloves of fresh garlic, 2 Tbsp ACV, and any spices you would like (I followed the Pho recipe for spices). Let this cook for 24 hours. Then strain off the broth and pour into a large glass container. I used large mason jars. 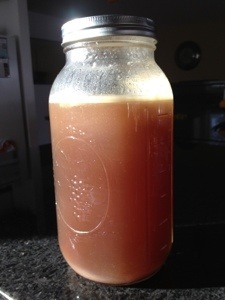 Leave 2 inches of headroom in the jar if you plan on freezing the broth to allow for expansion. Put all the chicken parts back into the crock-pot, minus the onion. Add back in another 1/2 onion, 3 smashed cloves of fresh garlic, 2 Tbsp ACV, and any spices. Repeat this daily for one week. The broth continues to become even more rich and flavorful as the days go on. I made 7 huge jars of broth to put into my freezer. Considering that those small boxes of broth at the co-op can be about $4.00 per box, if you get the organic stuff without MSG…this is a considerable savings. Yay for broth with health benefits that also leaves a little jingle in your pocket! Now I have 7 jars of Pho soup base in my freezer. When I am craving my favorite soup all I have to do is thaw out the broth and add some chicken, bean sprouts, basil, fresno’s, fish sauce, and fresh lime juice. Takes less than 10 minutes to prepare! If you do not have access to grass-fed animal products, you can order from US Wellness Meats, we order regularly and have never been disappointed!